Kent is a favourite destination amongst international students for its globally recognised degrees, cosmopolitan environment and exciting work opportunities both during and after your studies. Kent degrees are based on World Leading Research (Research Excellence Framework) and are taught by leading academics in their fields. The university offers flexibility and choice throughout its programmes. There are helpful pathway opportunities for international students, including English language and Foundation courses, to help you meet the requirements of your chosen degree. See our international pathways website for more information. Kent has partnerships with many international institutions, which create study abroad and work placement opportunities as part of its programmes. Kent graduates enjoy excellent career prospects around the world: more than 96% of Kent students who graduated in 2016 were in work or further study within six months. Students who choose to study at Kent have the chance to study in some fantastic locations in the UK and Europe. Kent also offers generous scholarships and funding for international students. Read our further information on why students choose Kent. You'll be part of a diverse community of students from around the world. 27% of our students are international, and many more live and study abroad as part of their degree. The University has established a number of support services to benefit its international population, with academic help, personal support and social events tailored to those studying away from their home country. Wherever you’re from, you'll feel at home at Kent. Jobshop, helping you find work while you study at Kent. Student Learning Advisory Service, helping you develop the skills required by your programme of study. Centre for English and World Languages, delivering courses in English language for academic purposes. Medical Centre, offering expert care on the Canterbury campus. Student Wellbeing, a dedicated team of professional to help with personal needs. Chaplaincy, a multi-faith service and a centre point for campus based spiritual life. Library, a team of support staff dedicated to helping students with the research requirements. Careers Advisory Service, a resource for Kent students graduating and beyond. Canterbury, Medway, Brussels and Paris have much to attract and satisfy their international student population. From September to June, the population of Canterbury doubles from its influx of students, many of whom are from overseas. In the summer months, the city becomes a thriving tourist hotspot, with visitors from all over Europe and beyond. Find out more about Kent's international cities. Kent is consistently voted one of the top UK universities in international student satisfaction surveys, and international students point to the welcoming social environment as a highlight of their Kent experience. The student union is host to over one hundred societies and clubs, the University organises international themed events through the year, and we run a Welcome Week to kick start your social life. Find out more about social life at Kent. From theatres to recording studios, libraries to laboratories, Kent's students learn in a purpose built working environment with top of the range equipment and all that you need to bridge the transition between study and work. Students also enjoy Kent's first class facilities through their sporting and social lives, with sports centres, nightclubs, restaurants and much more to choose from. Making the most of the surrounding environment, Kent students at Canterbury graduate from Canterbury Cathedral and Medway students from Rochester Cathedral. Find out more about the facilities at Kent. 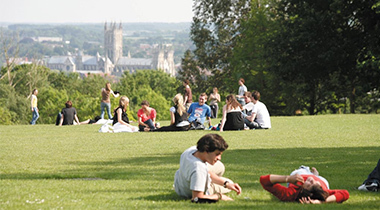 Kent is a popular choice with international students. You can find out what students are saying about their Kent experience at the international student testimonial page. At Kent we feel justified in our claim that we are the UK's European university. From courses with a European element to partnerships with over 100 European institutions, find out more about Kent's European connections.